Michael Ausiello is a brave man. Though I have never met the highly-respected US entertainment journalist, and know him only by his work on TVLine, which he founded, I have come to this opinion based solely on the heartbreakingly-hilarious book Spoiler Alert: The Hero Dies (A Memoir of love, loss and other four-letter words). How else could you view someone like Ausiello who, in the face of no doubt lingering grief – life may return to “normal” but grief has a way of reappearing when it is least expected – has chosen to pen a moving and yet also hilarious recounting of the life he lived with his partner Kit aka Christopher Cowan who succumbed to an aggressive form of cancer in early 2015? In some ways, writing such a book might seem obviously cathartic and desperately important – how could you not celebrate the life and love of someone so deeply important to you? But for the obviousness of the act, of the impelling need to celebrate everything that was good, and bad (Aussiello is charmingly and refreshingly honest about everything), you need to be enormously brave to go back to the loss of that special someone, the events of which time are seared with pain and loss unimaginable. Ausiello makes no bones about how painful it is, so unflinchingly in fact that if you have stood by a bed, hospital or otherwise, when someone you lose has died, you will weep, and without apology in the chapter in which Kit passes away, all too aware how final, and silent, and empty everything suddenly feels. A man who dreamed of growing old with his husband – they agree to wed at the end of the week of Kit’s first round of medical appointments – and opening a small antiques/collectables store in upstate New York, Ausiello, though clinging to hope that all will be well, spends an agonising 11 months coming to terms with the fact that this is likely to be one wish that goes cruelly unfulfilled. In the moment when Kit passes in their apartment, with Mike, and Kit’s parents Bob and Marilyn by his side, it becomes apparent that all the things that had been so good about their time together hadn’t so much come to an end as they had passed into that mystical realm of memory where only the bravest souls go to remember in fullness and without reserve. But Ausiello goes there, again and again in Spoiler Alert: The Hero Dies, recounting the meet-cute way in which he and Kit, an interior decorating expert with a love of mid-twentieth century furniture, and possessor of an acidic wit and formidably good taste, met and how they forged a relationship that moved quickly and grew, sustained by their collective sass, love of travel, certain TV shows and an intimately-shared knowledge that each was the only one for each other. Their great love for each other, but most particularly of course, Mike’s for Kit, is manifestly evident throughout, with this beautifully-immersive book full to brimming with moments where Mike recalls time after time when he was seized with overwhelming love or fondness for the man who became his whole world (a formidable role given how much Ausiello loves TV and his job … and Diet Snapple and Diet Coke). These memories fill you with great wistful joy but also, naturally, immense sadness that they are now the stuff of unique memory, unable to ever be bettered or repeated, but they come with am honesty which admits to the fact that, like most longtime couples, not everything was perfect in their relationship. Mike bravely – I use that word again because as someone who lost my dad recently, I understand what an immensely brave act it is to not just remember but live it all over again while you put figurative pen to paper – admits to all kind of collective failings, both in attitude and act, that marked their relationship, a selfless act that gives their time together a sense of lived, real and most importantly, affecting humanity. Without it, the story may have seemed like some sort of impossibly-wonderful rom-com-esque tale, and it is understandably important to Ausiello that Spoiler Alert: The Hero Dies be a true and accurate recounting of a life together well-lived, if it is to be an kind of fitting memorial to the person he loved. 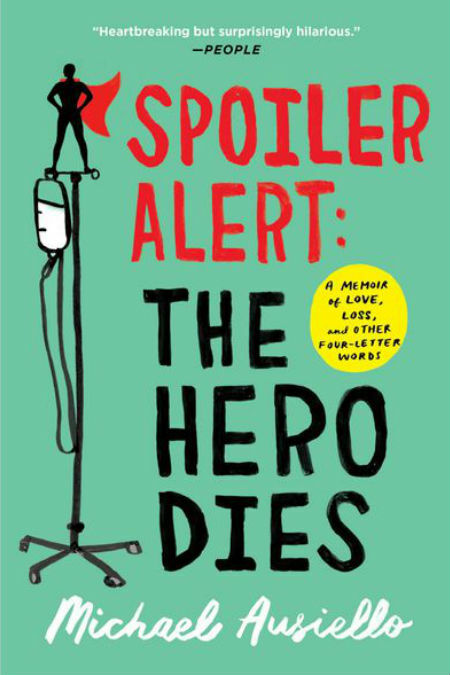 Spoiler Alert: The Hero Dies is a joy to read. This may seem like a strange thing to say about a book that, while it is full of fond evocations and richly-detailed memories, great humour and witty observations, and wholly-elevating recounting of new love’s first giddy steps, is also about someone’s death. But Ausiello has written this so beautifully, with so much honesty, wit and heart, so much reverence and care and yet fierce unflinching honesty, that you emerge with a picture of Kit as a fully-rounded three-dimensional character, and their relationship as something wonderful and rare but also flawed and imperfect, just like everyone else. But not, of course, like everyone else. For this is the uplifting funny and snarky, honest and joyfully-celebratory story of one man, the man who loved him (and who was life-affirmingly loved back in great measure) and the gloriously-good yet flawed life they lived together, a story that emerges with a universal humanity intact but, also with a unique sense that this was something special rare, alive and bouyantly-transportive that will never be repeated and so must be remembered in all its contradictory glories.